Every city of India has a history, stories, monuments and people linked to it. The people place project team has taken an initiative to give identity to each and every city, town and village of the country. The people place project is basically an editorial, firstly launched to showcase “amchi mumbai”. It was launched in 2014 and after the success of Mumbai chapter, the team decided to spread their wings across the cities of the world. People called Ahmedabad – yes, our very own Ahmedabad. A myriad of stories, Gujarati people and Gujju spirit. Ahmedabad, representative of Gujarat must have many books, editorial and coverages done on its heart for the history of centuries, for possessing those IIM graduates love, for having those historical monuments and chai ki kitli. The time has come, when a well documented, well researched book is written and published on Ahmedabad by a team of 17 years and after a year long research is being launched. The book is a celebration of 55 stories of Ahmedabad and the amdavadis. The launch of book is organized on Fri, 20th January, 2017, 4:00 pm IST at L&P Hutheesing visual art centre at Ahmedabad, India. The launch event is the celebration of being in Ahmedabad and being an amdavadi. 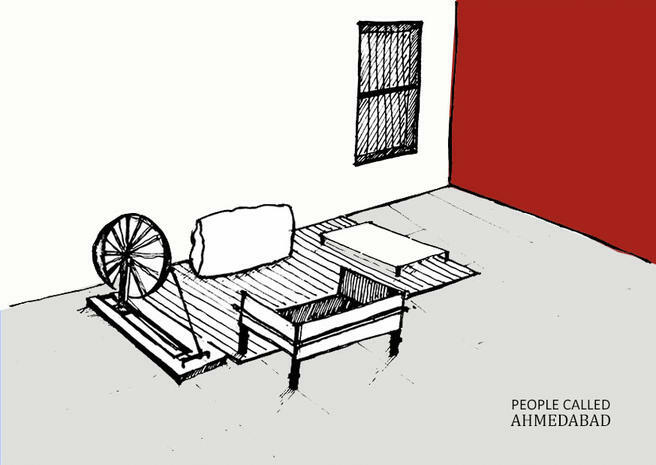 It will the making of the book “The People Called Ahmedabad” with all interesting stories. The event is open for all. Definitely, being an Amdavadi, Gujarati or Indian or I can say belonging to any part of the world, you will be curious to know more Ahmedabad. So don’t wait for long, just click on the link to be there in the event called My People My Place. To make the event more interesting, The People Place Project team has invited all the awesome Amdavadis to participate in the event. This is how you can be the part of the celebration. How do you see your Amdavad? What does the place mean to you? How you connect to it? Is it a place, an area, a sketch, a monument, a poem or a story? Just click on the link and register with your entry. All you have to do is pay Rs. 450 and submit the way you see your city. What we will be doing for you is we will print your photos, poems, and sketches and hold an exhibition on the day, where you can see your participation. You can send maximum of 5 photos or sketches per entry and 1 poem per entry. Not only this, but as a token of your love for your city, we are giving away copies of “People Called Ahmedabad” complimentary with each entry. So what are you waiting for. Is there some memory moving down your memory lane? Just take out your sketch pad or camera and move out in the lane of memoirs and exhibit your love for your city, Ahmedabad. What you are getting in return is another reward for your love for your city. The book “People Called Ahmedabad” is just the most interesting way of collecting the most interesting stories of your City, Ahmedabad. Apnu Amdavad. Thank You So Much ManjuShree.. Wish you had a great success in the launch event..